Alexandra grew up in Burlington, Ontario and graduated in 2001 from the Ontario Veterinary College. 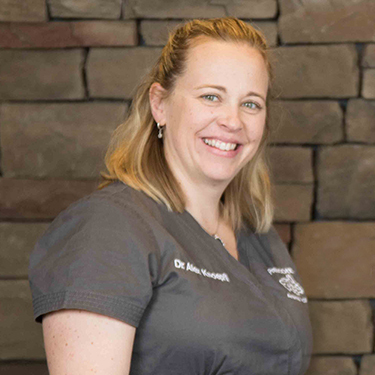 She was introduced to Prescott Animal Hospital as an externship student, re-joined the team upon her graduation as a full time small animal/equine veterinarian, and has since become an owner/partner in the Prescott Animal Hospital/Rideau St. Lawrence veterinary services organization. Alex enjoys all aspects of veterinary medicine, with a special interest in reproduction, behaviour, preventative medicine, and alternative medicine. Golden Retrievers hold a special spot in her heart. She has a great outgoing personality and loves to talk. She resides locally on her hobby farm with her husband John, three children; two dogs - a Golden Retriever Angus and a Miniature Schnauzer Jersey, three horses and two cats. Dr. Knoepfli is known for forming great long lasting bonds with our clients and patients.